I rashly said I’d join in on Sharyn’s challenge to cook something for her friend Lauren and at the same time celebrate her 1st anniversary blogging at the Kale Chronicles. Rash because of time restrictions and because I’ve never really joined in anything like this before. It’s also a competition and frankly the only person I am competitive with is myself. So what on earth was I doing? What suddenly changed my normal reticence for joining in, well there are prizes but most of all it’s about Sharyn’s blog. I wanted to join in the celebration. As the reality of a rash statement settled in, I needed to think about cooking for someone who has a restricted diet, how you adapt what you have for a limited diet. You want to cook a great meal, but with no compromises to taste and freshness. I asked myself what would I cook, it started with think local and allotment and so a meal of fresh greens from the allotment with locally caught Mackerel was born. 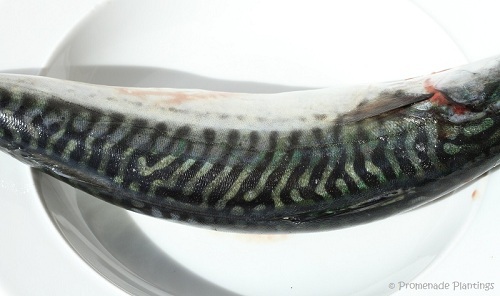 Mackerel is a beautiful fish to look at, the shiny skin, distinct stripes with hints and hues of colour. It’s also very local – at certain times of year you can see the shoals from the beach. Mackerel can only be caught when the sea is calm, they don’t come in when the its rough and churned up. They follow the Whiting into the shallower warmer water forming shoals jumping and shimmering in the sea, a frenzy of activity. Local people fish from the beach or take small boats out – their hauls destined for their freezers, if you have friends who fish they are precious friends indeed – happy to share their catch. If not you can turn to the small beach launched fishing fleet. The boats are tiny by modern standards, they only catch what is local, they can’t go far. This is sustainable fishing at it’s best. The weekend I cooked this meal I read about over fishing by various countries, complaints of reduced fish stocks – the same old arguments and issues. Fishing as an industry is a depressing read. I find the word industry jarring when applied to fishing, or farming. It dull’s me. But I realise how lucky I am to have options and to have such local options. If Lauren can’t get fresh or sustainably caught mackerel then I’d suggest a good oily fish as a replacement. It’s amazing how oily fish can take on big flavours. The original inspiration for this curry is from Anjum Anand. The curry hails from Chennai, east coast India where the sea influences the meals. Oily fish are abundant and the flavours used in this curry are of South India – of mustard seeds, curry leaves and coconut. The recipe calls for tomatoes but they are on the ‘No List of foods’ so I made this curry without tomatoes, I would also normally make this with fresh chillies for heat and tang, but they are off the menu too. No problem I say, let’s try this without chilli (who needs their heads blasted off anyway) and I wanted to see how it worked without using tomatoes as a base for a curry sauce. The result? Well it worked and it worked well. In fact it tasted delicious without the tomatoes and I didn’t miss the heat from the chillies. Having made it without tomatoes and chillies I would adapt the recipe a bit more by adding 1/2 a teaspoon each of powdered cumin and coriander to boost the flavour and a touch more turmeric and if I have it, fresh coriander chopped and sprinkled on top just before it’s served. Fresh coriander always lifts dishes. So I have adapted the recipe further. When I have made this before I used whatever tomatoes and chillies I have to hand, chopped up and added to the sauce and cooked down before adding the fish. You can choose which way to make it. I’ve found this curry to be even better the next day. Left to sit the flavours intensify and become somehow more rounded. Sharyn also requested that we cook with organic food, well my food is all grown on the allotment at this time of year, and I don’t use chemicals. The chard and garlic all come from the allotment, and I do have some turmeric and ginger growing in pots in the garden but they aren’t ready for picking yet, I was happy to oblige with her request..
And would I do something like this again? The challenge not the curry! Unlikely, I find its all too rushed and I’m not a great fan of “challenges”, I like to ebb and flow see where life takes me, explore and stop and look at what is around me, reach my destination in my own time, operate with less structure; there is enough structure and plenty of challenges at the moment in my life without adding to them! The fun bit was imagining cooking for two people I’ve never met before and picturing us taking a walk down to the beach in the morning to shop for fish, to see what’s fresh and then walking back via the allotment and picking the veggies for the meal. I can obviously do imagination ! Heat the oil in a wok or large frying pan and when hot add the seeds (mustard, cumin, coriander and fenugreek) and the curry leaves, let them sizzle in the oil for 30 seconds. Now add the ginger, garlic and stir it in. Stir in the powdered spices – cumin, coriander and turmeric and cook for a minute. When the coconut is well dissolved and mixed in, add the mackerel to the pan, and stir gently. Bring the contents of the pan back to a simmering point and add the tamarind paste, stir this into the sauce. The fish shouldn’t take long to cook, maybe 5 minutes in total. I take a piece and check it to see the colour of the flesh. You may need to add more water if the sauce is gets too thick, add a bit at a time. I also add a pinch of salt towards the end, I ‘ll leave that decision to your taste buds. Sprinkle some chopped coriander leaves on top and serve. Served with a simple pilau rice and fresh greens of chard – but more of that another day. Next Post Next post: You say tomato I say tomato ! and a dippy pepper or should that be a peppered dip? After reading the list of dietary restrictions I think you did great to come up with a dish Lauren could eat. I would never have thought of using mackerel in a curry. Guess that says a lot about my imagination. Hi Lulu, reading the list of No’s made me realise how fortunate I am to not have to really consider so carefully what I eat in case it made me ill.
Great recipe! 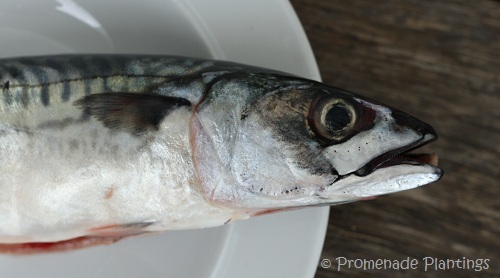 I love fresh mackeral. Best preparation I ever ate was in Macon, France…as tartare, believe it or not! In Macon? I’ve never stopped there, we tend to drive around or bypass it on our way to the Alps. But a tartare, which I adore, would be amazing with really fresh mackerel ! And maybe a glass of soemthing dry and white……. Sounds like this was quite a challenge! You were up for it, Claire, with your arsenal of fresh herbs and vegetables from the allotment, and your keen sense for Indian flavors…this sounds amazing! Not all fish could stand up to these strong flavors, but what a great enhancement when you know one that can hold its own. Thanks for a great recipe! Thank you Cindy, I wante dto cook something nice for Lauren, but it had to be something that we were going to eat ourselves! Certainly go me thinking ! I don’t usually enter contests either, Claire, although I did Movita Beaucoup’s birthday cake thing because she is so much fun. The mackerel curry looks great — I’ll bet Lauren will appreciate it. Oh I remember the birthday cake thing and the voting, her blog is a lot of fun! I bet mackerel made great fish tacos. Now you have reminded me that I posted an Indian style taco recipe, but I made it with white fish, so now I’m wondering what it would be like with an oily fish…….. I think some of my “glazing over” is down to the fact that I keep reading the same thing especially about fishing, the argument or solutions neve rseem to move on! It’s not that I don’t find it interesting or recognise it as important I just get bored by hearing the same old…..
Luckily for us we can supplement our diets with home grown food !! It is important, but Malthusian projections, even in a more limited system like fisheries, tend to be dreary. There are success stories out there as well, Nature Conservancy and others funding good sustainable fishery projects…FWIW. I am so glad to hear you say (write!) that you are not fond of blogging challenges! I don’t care for them either! But that said, when I do participate I find myself stretching, learning and still cursing the deadlines! A scrumptious and healthy recipe! I really must cook with mackerel more often. A thoughtful motivation and a great looking recipe. Thank you Alice, it was a good meal and a good reason to think a bit more about what we eat.It reminded me of how fortunate I am in being able to eat pretty much what I like without major health problems. Claire, first of all this recipe sounds absolutely wonderful, right up my beach! We love this sort of cooking & these rich and colorful flavors of India. (Will probably substitute with salmon which is wild and abundant here.) Really stunning recipe and I’m pinning it for future use. Secondly, I so relate to your aversion to the competition thing, and to your affinity for a more organic ebb and flow, finding that natural pace & rhythm within your days. (No wonder you and gardening are such friends!) I feel so at home in your company and do so love your blog! Thank you Spree! I think you would enjoy the curry and I bet the frehs wild salmon would work really well. In fact I have a few mor efishy recipes that I need to write up, where does the time go? I sometimes wonder if challenges would be goo dfor me, they would create a bit of structure and form to my blog and life, which sometimes is no bad thing – it might make my reasoning better or improve my writing…. . But I do like wandering along, ebbing and flowing in my blog. It’s a part of my life that I can do that with. And how lovely you feel at home…… huge smile !! My mother is a huge fan of mackerel, so I’ll have to make this coconut curry version for her. I hope your mum likes it, I love Indian flavours so I’m biaised. I did look at Thai style curries but so many of them use soy or fermented products which Lauren can’t have. 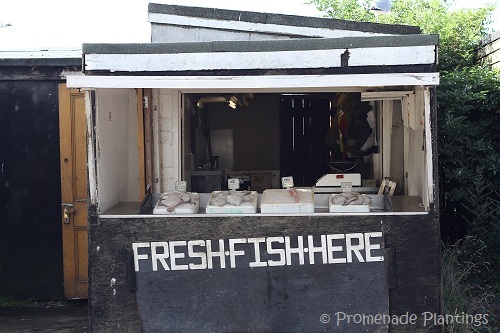 I love the fish shops Celi, they are literally huts that have been cobbled together and patched up over time with whatever was to hand or was cheap. 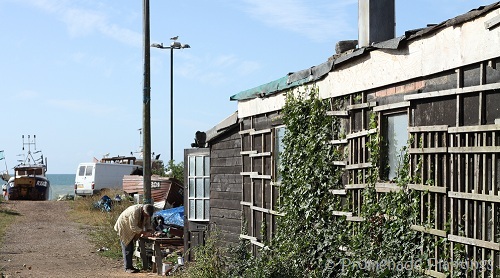 They are right behind the boats on the beach, the fishermen bring in the catch and some goes to these shops. All very photogenic and tasty ! Well done, Claire! Love that you chose to go “indian” with your recipe and you adaptations to suit Lauren’s dietary restrictions were quite clever. Though you may not win the contest, this recipe sure is a winner! Thank you Valerie. I think blogging is like looking in on the everyday, the normal which when it’s not your life becomes extraordinary and fascinating! Hope you like the curry, it’s not too messy and complicate dto make, even though the list of spices is fairly long, and I’m sure you will “play” with it too ! I’m all in favor of just about anything with coconut and curry. Thank you Tandy, I hope you get to make it ! Thank you Debra, it certainly was a challenge but did really make me think about how much I take for granted and how fortunate I am that I can eat pretty much what I want. I really like the top two pictures. 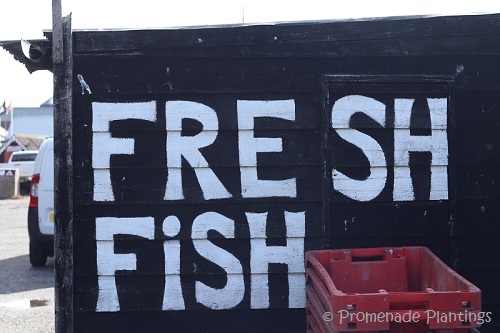 Thank you Shimon, I think the fish shops are so photogenic, all character and stories ! Claire, you created a wonderful dish! The variety of spices sound so wonderful together. How sweet of you to attempt a dish for Lauren, her resistrictions are a challenge indeed, but you pulled off a great one! Your comment on knowing a fisherman sticks with me as when my son was little he had a friend whose father did alot of fishing and I reaped alot of fresh caught fish!! I was so sad when the boys went to different schools and grew apart!! Hi there and thank you for your encouragement and kind words ! Cooking something for Lauren certainly made me think about what I usually add to dishes to create flavour, so it encourage dme to think beyond that. I’ve never actually eaten fish curry – I love mackerel, so that would a good place to start, I think. I love fish curry, but then I love curries! I like Thai style green curries with fish too, maybe that would appeal to your tastebuds ? I’m not fond of Thai green curry but perhaps with Thai red curry? Marvelous! I make coconut curries sans tomato very often, though I like tomato curries well too–just something I got in the habit of doing long ago. I agree that mackerel is beautiful looking, so why not enjoy both its glamorous handsomeness *and* its curried deliciousness, eh! It’s was a bit of an experiment for me Kathryn to make it without tomtoes, but I’ll do it again, come winter when there are no decent tomatoes to be had!